Hello sweet friends! I hope you had a wonderful Thanksgiving. If you’re are coming from Sweet Nothings I am so glad that you stopped by Storybook Cottage. BJ is always so inspiring in her Christmas decor. Today I am bringing you an Easy Vintage Inspired Christmas Craft. This project contains an item some people would throw away. Last November I made gifts for nominees and decorated a table for the National Cowgirl Museum induction ceremony. Wooden boxes were filled with flowers nestled in small mason jars that I used as vases. I saved the jar lids and rings in a ziploc bag for over a year. You aren’t a hoarder if you actually use things right? Punch a hole at the top of each ring. Glue down a vintage image on each side of the lid. Add vintage trim to the inside of the ring. String a piece of knotted ribbon or trim through the punched hole to create a hanger. Add a thin layer of glue then glitter all of the visible areas of the metal ring both front and back. You will get glitter everywhere else too. The beauty of these ornaments is that they can be customized to suit any holiday decor. I don’t have any of the supplies needed to create these. I don’t have any time to make these during this busy holiday season. So I bring you good news. Every year I create a series of limited edition ornaments and give 100% of the profits to a worthy cause. This year’s giving is very near and dear to my heart. You may have heard about the recent wildfires in Northern California. The Camp Fire completely decimated the beautiful town of Paradise, California which is very close by to where I grew up. My cherished longtime friend, Betty, lost her entire home. Some of you may have read about Betty on my Facebook page. We have been good friends for over 20 years. It was an agonizing four days for me before I learned if my friend had made it out alive. The fire came on so quickly that many others lost their lives. I was worried sick as Betty had lost her dear husband Barry just last year and lives alone. Betty is retired and lives on a fixed income. So this year’s ornaments are dedicated to helping my dear friend find another home. UPDATE: THE SHOP IS SOLD OUT! Thank you! All of the ornaments are listed in my ETSY SHOP. The ornaments are just $10 and this week I am offering Free Shipping. 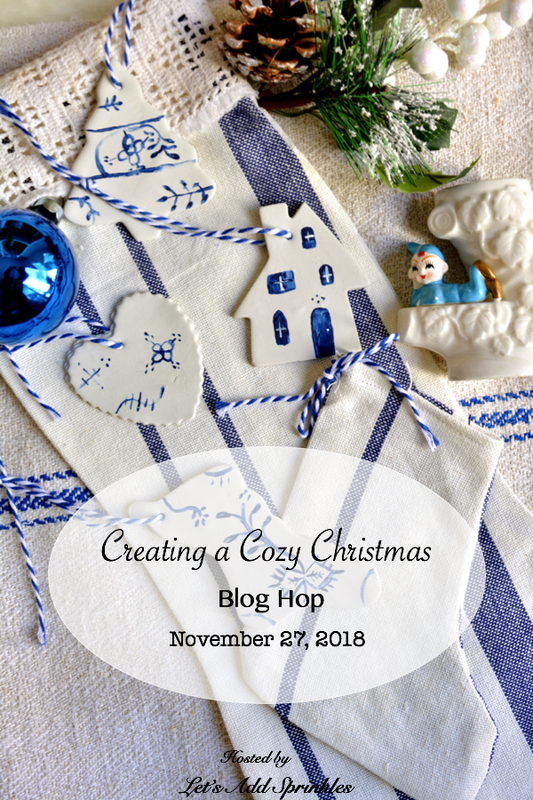 Please be sure to visit all of the wonderfully cozy on this Christmas hop which was beautifully organized by my friend Katie at Let’s Add Sprinkles. Up next is Chasing Quaintness. You won’t want to miss her adorable home! So sorry about your friend Laura! Those fires were/are devastating. She is in our prayers….as are all those people who lost everything. on another note, how clever you are to make these adorable ornaments. I will be visiting your shop. Have a great day! I do remember reading about Betty on your FB page. This is a lovely thing to do — true giving Tuesday spirit. Laura, your ornaments are just adorable and I love your idea for contributing to those affected by the wildfires like your friend. Happy to be joining you in the hop! Hope you have a blessed Christmas season, Cecilia @My Thrift Store Addiction. Laura, your ornaments are absolutely beautiful. I can’t wait to visit your Etsy shop and to try this project myself. Thank you also for sharing so generously helping your friend. I love these. They are so very pretty, Laura. I do love the vintage feel to all of them. What a sweet friend you are. I remember your FB post about Betty. I’m so glad she made it out. Please keep us posted. Thanks for joining our fun Creating A Cozy Christmas Blog Hop. Oh Laura, I am so sorry to hear about your friend. Such a tragedy. Your ornaments are so cute and you still amaze me with your creativity. Laura, I love these ornaments! This is such a creative project and I have an entire box of lids that I can use to make some cute ornaments for family members! So sorry to hear about your friend and how sweet of you to raise money for her…such a horrible thing to happen! Have a great day! Laura, my life as an elemtary teacher was filled with bags and boxes of things that could be used in my classroom art center. I don’t consider it hoarding, just being thrifty. I no longer save as many things, but old habits seem to hang on. I find I just can’t toss some things that others might use. I’ll save a bag of jars, or gift bags and take them to the thrift store. Your ornaments are charming. The CA fires break my heart. So many losts everything. I was happy to read that Betty was safe, but her life is certainly turned upside down. I have a friend in Chico, so I was staying in close touch with her. Thanks for sharing, Laura. Merry Christmas! This is such a perfect ornament idea for young & old to create! And very much like you to make it a chance to give for a personal & incredibly worthy cause. My heart has been breaking for all those that have lost everything and in some cases everyone that they hold dear. I’m so glad your friend Betty is alive. May our wonderful Lord bless you always for your compassion & generosity Laura!! Laura, thank goodness that your friend is safe. The ornaments are so sweet. If I have extra mason jar lids, I’ll save them for you. Great creativity. I absolutely love your ornaments Laura! I will definitely be making a few! I am so sorry about your friend’s loss. You are so caring and such a good friend. Praying for a miraculous intervention in finding a new and safe home for Betty.. So happy to be joining you on the hop this week. Thank you for reminding me to be more grateful. I have been in a “mood” all day because I am not happy with my Christmas decorating so far. Now I feel spoiled and ridiculous. I have so much to be thankful for when others are suffering loss. Merry Christmas season dear friend! All the fire victims need our prayers; thank you for your effforts to help. I loved your ornaments; I have made similar ones with juice can lids and wooden curtain rings. I love putting a small plastic deer/Santa/snowman, etc. in them! They go well at our church bazaar. I got some Joanne’s fabric that had 4″ white circles that say “I craft so hard I sweat glitter.” Made several little aprons with that in the center—one for my daughter’s elf; the grands will get a kick out of her crafting with an apron on (I warned her to do the vignette on a piece of paper caz I just know that elf is gonna make a mess with the glitter!). I may get the glitter out of my house by July! Laura that was such a wonderful thing you did to help out Betty. And it is no wonder that you sold out your ornaments are adorable. Your post has been chosen by our readers as most popular for this week over at Sweet Inspiration. These are beautiful!! Such a great idea! Visiting from the Sweet Inspiration party.